The IAEA already is investigating evidence that North Korea transferred a nearly operational nuclear reactor to Syria, which Israeli jets subsequently destroyed in 2007. U.S. and U.N. officials now worry Pyongyang could begin exporting its advanced centrifuge equipment to its military allies in Iran and Myanmar. "A uranium enrichment capability in [North Korea] could bolster its pursuit of a weapons capability and increases our concerns about prospects for onward proliferation of fissile material and of sensitive technologies," Glyn Davies, the U.S. ambassador to the IAEA, told the agency's 35-member board Thursday. Mr. Davies said the U.S. believes Pyongyang may have already developed uranium-enrichment facilities beyond the one site it showed a visiting American scientist, Siegried Hecker, last month. These additional facilities would allow North Korea to significantly increase its numbers of atomic weapons, as well as their yield. "It is likely that North Korea had been pursuing an enrichment capability long before the April 2009 date it now claims," Mr. Davies said. "If so, there is a clear likelihood that DPRK has built other uranium enrichment-related facilities in its territory." Since North Korea made public its uranium-enrichment capability last month, the Obama administration has struggled to formulate a new policy toward leader Kim Jong Il's government. 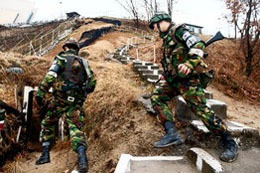 This has been compounded by the North Korean attack on a South Korean island on Nov. 23, which dramatically heightened tensions in Northeast Asia.